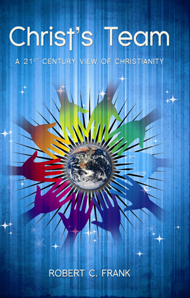 Christ’s Team: A 21st Century View of Christianity: Christ is Risen! The spirit of Jesus Christ continues to be present throughout the entire world, providing assurance of God’s forgiveness and teaching everyone to love and care for each other. Christ’s Team, made up of servant leaders like him, is the largest team on earth. They continue to spread the good news worldwide using the superior communication facilities created with the aid of science and technology. On the night before he was crucified, Jesus gathered his followers in a room in Jerusalem to share some bread and wine. “While they were eating, he took a loaf of bread and after blessing it, broke it, and gave it to them and said, ‘Take: this is my body.’ Then he took a cup and after giving thanks, gave it to them, and all of them drank from it. He said to them, ‘This is my blood of the covenant, which is poured out for many. (1)’” This event which is now called the Lord’s Supper was his way of alerting them that he was going to be crucified and his body and blood would be sacrificed for the sins of all people. In our current world, Christian churches reenact this event not only during Holy Week, but on other occasions during the rest of the year. In modern medicine, functional organs are transplanted, and blood is transfused to save the lives of people who are ill. One way of understanding the Lord’s Supper is to think of it as having the spirit of Jesus transplanted into each of us through the consecrated bread and wine. It is thus helpful to remind ourselves afterward that the spirit of Jesus Christ lives within us.